19-20 November 2019 – The Point at Emirates Old Trafford, Manchester, UK. The conference remains the leading technical event in Europe highlighting operational efficiencies, best practice, regulatory change, research and new technology in the fields of biosolids and other organic resources. 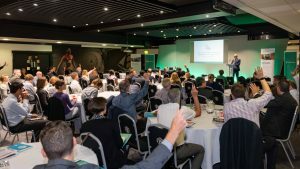 The 2018 event saw 270 attendees enjoy a busy two days at the Royal Armouries in Leeds, which featured more than sixty technical presentations, panel debates on Anaerobic Digestion and landbank security, a double site-visit and a sell-out conference dinner. If you would like to give a presentation addressing one (or more) of the above themes, then please submit an abstract following the conference guidelines. Take a look at the video from 2018 and see what our attendees had to say.